Coverage: Ball-by-ball BBC local radio commentary of every match in Division One and Division Two, plus live text coverage of every round of fixtures on the BBC Sport website. Sir Ian Botham has never been a man to mince his words. The former England all-rounder, appointed as Durham's new chairman last November, has been clear in his message about the north east county's predicament - it is time to stop whinging and look towards the future. The club are preparing for life in Division Two, having been relegated in 2016 and handed a 48-point deduction after seeking financial help from the England and Wales Cricket Board. "It's two wins," Botham said at his first official news conference in the role. "The team are more than good enough to get those two early wins and then in Division Two they'll be the best side by a distance." 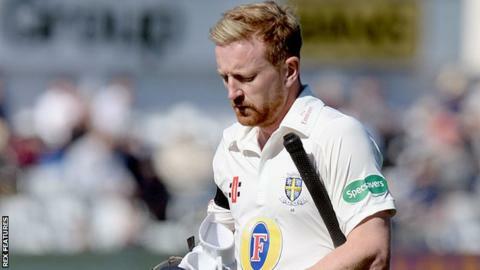 With just one day to go until the start of the new County Championship season, BBC Sport takes a look at Durham's chances and some of the main talking points elsewhere. BBC Radio Newcastle's Martin Emmerson has witnessed every one of Durham's highs and lows from the commentary box over the past 17 years - from their title wins in 2008, 2009 and 2013 to last season's turmoil off the field. While it may have been a tough winter at Chester-le-Street, Emmerson believes Botham has brought a new buoyancy to the club. "It is just the sort of lift Durham needed," said Emmerson. "He also said the club is now in a good position financially and should have a secure future. "It's been a long hard winter though. A winter of anger and disbelief. A winter in which players, staff and supporters could not understand why the club had been dealt such an awful hand by the game's governors. But now it is time to move on." Supporters are also getting behind the county ahead of their Championship opener against Nottinghamshire on 14 April. "Membership has increased by 5% as fans rally around the club. It's the first rise for eight years," added Emmerson. "The fans are coming out fighting and everybody wants to 'Bounce Back Together', which is the new mantra in Chester-le-Street. "There is an awful lot of resentment in the north east towards the ECB and I feel it will remain for a long time. Some supporters are already planning their methods of protest. "The day they relegated Durham they issued a statement talking about how they had saved first-class cricket in the north east. And, while this may be true in part, there was no acknowledgement whatsoever from the ECB about how they were also partly responsible for the financial problems that befell the club. "The relegation was beyond anything the ECB had in its statutes at the time and therefore beyond anything Durham expected. The 48-point deduction in a new 14-game season also seems draconian and tough to overcome, even with a good squad in place." Two in a row for Middlesex? The 2016 County Championship saw arguably the most enthralling climax in its 126-year history, with three teams still in with a chance of claiming the title going into the last few overs. At Lord's, Middlesex and Yorkshire were going at it blow-by-blow in search of a victory that would make the crown theirs. Somerset's players, meanwhile, watched nervously on television screens in Taunton, knowing a draw in the capital would hand them their first-ever title. The Tykes were set 240 to win in 40 overs on the final day and, following a frantic evening session, it all ended in the most dramatic way possible - a Toby Roland-Jones hat-trick sealing Middlesex's first County Championship trophy in 23 years. The county have not made any new signings this summer but, with a pace bowling unit of Roland-Jones, Steven Finn, Tim Murtagh and James Harris, they will trouble any batting side once again. So who are the pretenders to Middlesex's crown in 2017? Yorkshire begin life under new first-team coach Andrew Gale looking for their third title in four years. They are once again likely to be depleted by international call-ups, with Joe Root, Jonny Bairstow, Adil Rashid and Liam Plunkett all part of England's one-day side - and former captain Gale has swapped his whites for a tracksuit. Plenty will rest on the shoulders of new skipper Gary Ballance, as they will surely require a stack of runs from the left-hander. Somerset need to get over the heartbreak of last season quickly and the retirement of Australian run-machine and captain Chris Rogers will not help their cause. Talented wicketkeeper Steven Davies has arrived from Surrey, and young opener Tom Abell will lead the side. It seems a tough ask for the Taunton club to repeat their fine 2016 campaign. Ex-England captain Michael Vaughan has tipped Surrey as his champions - and on paper they look formidable. The close season signings of Mark Stoneman and Scott Borthwick from Durham has strengthened the batting considerably and they have two of the best young seamers in the game in Tom and Sam Curran. Lancashire and Warwickshire cannot be ruled out, but the Bears will lose their best player, Chris Woakes, for the majority of the season with England. Hampshire have been something of a yo-yo club in recent seasons, although James Vince's England Test career appears to be on hold at the moment, so the south coast side look set to have their captain available. Division One new boys Essex are strong in the batting department, with Alastair Cook likely to play plenty of matches in the early summer, but they have an inexperienced bowling line-up until Pakistan's Mohammad Amir arrives for the second half of the campaign. Cook is set to miss Essex's first game against Lancashire on Friday with a hip injury. However, the 32-year-old is expected to be available for his county side for the majority of the first half of the season until England's first Test of the summer against South Africa in July. "For the first three months of the season it will be great to be around," Cook told BBC Sport. "We've got a good squad and we want to test that squad against the bigger boys of the four-day stuff. If we play well we've got a chance. "It is going to be tough - we're probably the bookies' favourite to go back down. One thing we have got is a lot of strength in depth in our batting. We've got some good players, people like Tom Westley, Nick Browne - it's our first opportunity back in the first division and they'll be desperate to make their point and move on to bigger things." The ECB says the injury is "left hip soreness" and he is to have an injection. "It's frustrating," added Cook. "I've been fairly injury free in my career, so to pick up a niggle now, it is frustrating - and the chance to play against Jimmy (Anderson) is not happening. But it is what it is." A full round of day-night matches for the first time from 26-29 June using a pink ball. Play starts at 14:00 BST. This summer will see several overseas players turn out for counties under Kolpak deals. A number of South Africa internationals have turned their backs on their country and former West Indies batsman Shivnarine Chanderpaul has joined Lancashire as a 'non-overseas' batsman. Kolpak contracts allow sportsmen from countries that have associate trade agreements with the European Union, including South Africa and some Caribbean nations, the same right to free movement as EU citizens without being classed as "foreigners". The ECB have only confirmed player availability into May, but Ben Stokes (Durham), Jos Buttler (Lancashire) and Chris Woakes (Warwickshire) are the only players involved with the England Test side over the winter who will be absent at the start of the season because of their IPL contracts. Because of the Champions Trophy, there will be no Test cricket in England this summer until July, and counties with players in their ranks who are solely involved with the national team for five-day cricket can probably expect to see a lot more of them. Last summer, Cook scored 523 runs in Essex's first four matches of the summer, at an average of 130.75, and now free of the England captaincy he will be back at Chelmsford and looking to fill his boots once again. Lancashire and Durham will also be hoping to reap the benefits of having Haseeb Hameed (1,198 Championship runs in 2016) and Keaton Jennings (1,548 in 2016) available early season when the pair may be fighting it out for one spot in England's top order against South Africa on 6 July. Steven Finn (Middlesex) and Mark Wood (Durham) are fast bowlers with eyes on a similar prize, should the selectors decide that Anderson-Broad-Woakes is not their preferred pace line-up for the Tests.